“In order to enhance the political environment for realization of the commitments made at the Panmunjom Summit and the subsequent DPRK-US Singapore Summit, we appeal for all countries to refrain from the confrontation and militarization in the region,” the EFK said in its statement at the end of the meeting on 23 June. “In addition, in order to remove obstacles to development cooperation in the spirit of the Panmunjom Declaration, we call for the economic sanctions against the DPRK (Democratic People’s Republic of Korea) to be lifted immediately,” the EFK said. Members of the Korean Christian Federation (KCF) from the DPRK and the National Council of Churches of Korea, from the Republic of Korea, sat at the same table during the meeting. “In particular, we celebrate and affirm the Panmunjom Declaration as a transformational expression of inter-Korean leadership for peace, prosperity, and reunification of the divided Korean people,” said the EFK statement. The Panmunjom Declaration for Peace, Prosperity and Unification of the Korean Peninsula was adopted between North Korea and South Korea on 27 April during the 2018 inter-Korean Summit. “We commit ourselves to the ‘Panmunjom Process,’ a new phase in the history of ecumenical engagement for peace and reunification on the Korean Peninsula, taking the heritage of the ‘Tozanso Process’ and building on it in the framework of the Panmunjom Declaration,” they said. The statement called on all churches and all people of good will around the world to join with the EFK in efforts for the realization of the objectives of the Panmunjom Declaration. 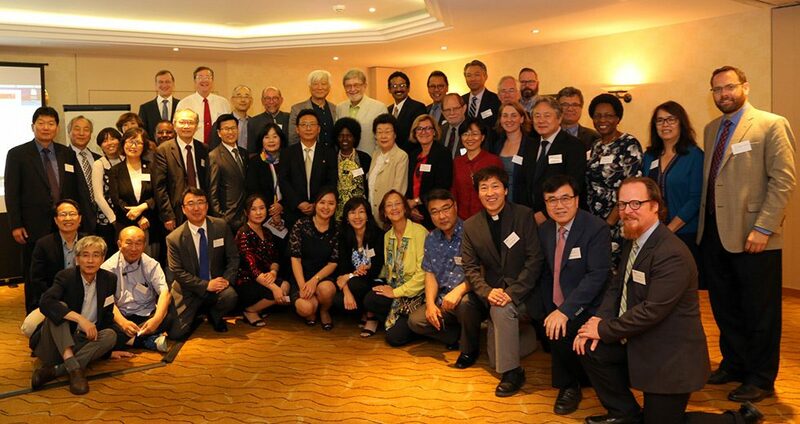 “We extend an invitation to all churches and ecumenical organizations to consider joining future discussions, initiatives, and meetings of the EFK, in order to promote strengthened ecumenical solidarity and support for the people of Korea in the realization of their hopes for peaceful coexistence, reunification, development, and co-prosperity,” they said. The EFK envisaged and proposed that its next meeting should take the form of a peace convocation on the Korean Peninsula. “The WCRC is committed to working with the EFK, other ecumenical bodies and the faith collectives for peace and reconciliation in the Korean Peninsula. We look forward to working with our partners and member churches to advocate for demilitarization and peace,” said Philip Peacock, WCRC executive secretary for justice and witness.